The everyday realities of New Orleans citizens prior to Hurricane Katrina stood in stark contrast to America’s view of itself, particularly before the recent financial crisis. Prior to Hurricane Katrina, nearly 20% of the city’s 450,000 residents live below the so-called poverty line. Within the black community in the city, about 30% of that population was below the poverty threshold, though the national average for Black Americans was about 25%. The national poverty level for all Americans was 12.7% in the year before Hurricane Katrina. In other words, the black poor in New Orleans–based on a statistical map that captures little of the challenges faced by those just above the poverty line—represented nearly three times the rate experienced by the average poor American. For those musicians who toiled in the city and represented its unique cultures nationally and internationally, their music was often a way to bear witness—to testify, if you will—on behalf of the city’s people and their spirit of resistance. 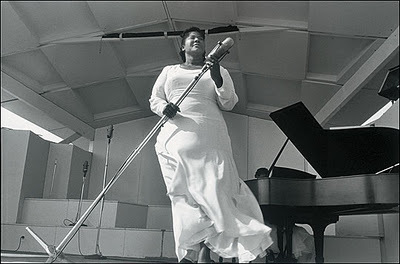 Though the sanitized image of Mahalia Jackson, that her record companies Decca and Columbia largely contrived in an effort to cross Jackson over as a beacon of “Black Respectability” stood in opposition to the decidedly secular, sexual and profane sounds and images of New Orleans, Jackson's musical sensibilities, like many of her peers born and raised in the city, always bore witness to its spirit. The livelihoods of many of New Orleans working class and working poor communities were inextricably tied to their roles as service workers in the tourism industry. In other words, for much of the year, some sections of New Orleans were little more than underdeveloped outpost—not of some so-called “third world” nation, but right in the United States. As Lynell Thomas writes; the city’s tourist industry “invites white visitors to participate in a glorified Southern past.” Black residents, if they appear at all in this narrative, appear as secondary characters who are either servile or exotic — always inferior to whites and never possessing agency over their own lives.” Thus perceptions of the black poor on display at the New Orleans Convention Center or in the Louisana Superdome were framed by a national imagination that had historically viewed them as service workers or at best, entertainers. In many ways, the coverage of Hurricane Katrina survivors functioned as little more than a national travelogue. In contrast to the kind of natural emotional release that Jabir, himself bears witness to, the invocation of New Orleans cultural and musical history in the aftermath of Hurricane Katrina was more akin to a marketing plan. In the immediate aftermath of Hurricane Katrina and the failure of the levees in New Orleans, there were many high profiles efforts to raise awareness about the cultural legacy of New Orleans. Many of those efforts centered on the exaltation of New Orleans Jazz, with many events aimed at providing shelter and support for Jazz musicians dispersed by the tragedy. New Orleans Jazz seemed the most important resource to be protected in the months after Katrina, more so than the people who made the city such a vital and important, ever evolving cultural outpost. Lost in the focus on New Orleans Jazz—arguably one of the nation’s most important cultural exports—are other forms of musical expression that were and continue to be crucial to the survival and spirituality of New Orleans and its citizens, including those who have yet to return. Though Jazz was a critical component of Black political discourse and intellectual development throughout the 20th century—jazz musicians like John Coltrane, Billie Holiday, Max Roach and Abbey Lincoln are some of the most resonate examples of creative intellectuals—New Orleans Jazz is often depicted as being tethered to some imagined past, in which race relations and the power dynamics embedded in them were far more simplistic. Indeed films like The Princess and the Frog and The Curious Case of Benjamin Buttons and the television series Treme (despite its progressive political critiques) contribute to a nostalgic view that New Orleans Jazz as a dated, static musical form that offers an “authentic” alternative to more commercially viable forms of popular music like rap and R&B music. Much of this has to do with the relationship between New Orleans Jazz and the leisure and tourist industries that were so vital to the city’s economy. In this context, mainstreams desires to save New Orleans Jazz and to protect its musicians are less about strengthening the links between Jazz and Black cultural resistance—a resistance that historically fermented in New Orleans—but maintaining the economic vitality of what Johari Jabir calls the “theater of tourism” in which Black bodies are rarely thought of as citizens but laborers, servants and performers. In the introduction to the book, In the Wake of Hurricane Katrina: New Paradigms and Social Visions, the late scholar Clyde Woods places New Orleans Jazz in a much broader context, as part of what Woods has famously described as a “Blues tradition of investigation.” As Woods notes in his essay, “Katrina’s World: Blues, Bourbon and the Return to the Source,” historically the city of New Orleans and the region was “latticed with resistance networks that linked enslaved and free blacks with maroon colonies established in the city’s cypress forests swamps.” These traditions of resistance would manifest themselves after Emancipation and beyond in the form of “societies and benevolent associations; churches, second lines, pleasure and social clubs; brass bands, the Mardi Gras Indians” and of course New Orleans Jazz. Two practices also linked to resistance in New Orleans are Bounce music and what Jabir again refers to as the “sanctified swing,” embodied in the genres of Rap music and Gospel respectively. One piece of post-Katrina cultural expression that gives voice and presence of the kinds of resistance that Woods highlights is the documentary Trouble the Waters; a film which troubles the national memory of places and spaces such as New Orleans. Indeed there’s a haunting presence about Trouble the Water, a presence that is immediately felt by anybody who has had the chance to journey across the city of New Orleans in the past few years. While tourists travel about downtown New Orleans and the French Quarter blandly commenting on the limited hours of some of the city’s more authentic haunts, and the Lower 9th Ward continues to serve as the most lasting monument of the destruction, portions of the city remain a decidedly barren reminder of the vibrant living cultures that once existed in the city. Of course where there are no people, there is no culture and the slow pace of recovery in the city suggests that something more sinister might be in play. Nevertheless, if Hurricane Katrina offered the rationale for what might be the only most contemporary example of ethnic cleansing in the United States, then the power of Trouble the Water comes from its brazen ability to summon the voices and spirits of those—who by force or choice—have not returned. As such Trouble the Water is a striking intervention, for a city that lacks the bodies—and the political wills that such bodies possess. Trouble the Water tells the story of Kim Roberts, a 24-year-old New Orleans resident and aspiring rapper and her husband Scott, as Roberts documents their experiences before and after the hurricane on a hand-held video camera. Produced in collaboration with Tai Leeson and Carl Deal, the very fact that the film exists speaks to the economic realities of so many Katrina Survivors. As Rivers told the Brooklyn Rail, “We’d run out of money. We had about a hundred dollars left, and we was like, “We ought to try to see what we could do with this tape; we might find somebody we could give this tape to; well not give it, but either sell it, or license…you know, see what it’s worth.” Robert’s comments capture the DIY ethic that has informed hip-hop generation expression, but also taps into more traditional African-American sensibilities that can be best captured in the notion of “make a way out of no way.” If we think about survival as distinctly improvisational mode of navigating in the world, Trouble the Water finds it grounding by harnessing the rhythms of black improvisation via Robert’s audio and visual narration. Though Roberts and her husband survive the hurricane, Trouble the Water still serves as tribute to those who were lost in the storm and I’d like to suggest the film serves as a kind of “second line” performance—the parade of dancing, shuffling bodies that occurs, often after a funeral. According to musician Michael White, “at the time of their origin, these parades offered the black community an euphoric transformation into a temporary world characterized by free open participation and self-expression through sound, movement and symbolic visual statements.” White adds that “impositions and limitations of ‘second class’ social status could be replaced by a democratic existence in which one could be or become things not generally open to blacks in the normal world: competitive, victorious, defiant, equal, unique, hostile, humorous, aloof, beautiful, brilliant, wild, sensual, and even majestic.” As such Trouble the Waters serves as a critical intervention into a national memory that would rather ignore the cultural gifts that New Orleans gave the young country, the dead bodies that were sacrificed in the midst of catastrophic circumstances, as well as the possibility of rebirth that the Katrina Politicians — those bodies dispersed by the floods —embody. Mahalia Jackson knew a great deal about second lines. According to Jazz historian Robert Marovich, Jackson was “exposed to, fascinated by and, most assuredly a participant in the second line of New Orleans Marching and Funeral bands.” Though Jackson came to prominence in Chicago, the legendary Gospel singer was born and raised in New Orleans’s Lower Ninth Ward. Jabir suggests that one of the reasons that Jackson is rarely thought about with regards to New Orleans has to do with “the ways the canon of New Orleans music is recognized exclusively through the lenses of blues and jazz.” More importantly Jabir writes, the impact of New Orleans music on Jackson—what she called “a rhythm we held on to from slavery days”—allowed her to bring an element of “swing” (associated with Jazz) to the decidedly anti-secular Gospel tradition of the mid-20th century. Using the example of Jackson’s often-recalled performance of “Didn’t It Rain” at the 1958 Newport Jazz Festival (for which she was heavily criticized by the “true believers”), Jabir suggest that Jackson’s performance of the song anticipates the Hurricane Katrina disaster that occurs more than thirty years after her death. Jabir is not so much suggesting that Jackson had the capacity to tell the future—though the history of the region might suggest otherwise—but that the “sanctified swing” that marked her music and others like Duke Ellington (or Wynton Marsalis if you listen to In This House, On This Morning) is “a heartbeat, a pulse driven by a persistent rhythm” adding that “if music were a living organism, the pulse would hold the music steady, sustaining life in the midst of various rhythms.” Ultimately, according to Jabir, Jackson’s performance of “Didn’t It Rain” is a “tenacious hope that finds the singer describing the disaster, accepting it, and living in spite of it”—a gift to those who would come well after Jackson who could grab hold to the “sanctified swing” when faced with their own survival. Marovich offers even more distinct connections between Jackson’s New Orleans roots or routes, if you will, to sample a bit from political scientist Richard Iton. Marovich specifically five such examples in the “Rhythmic Pulse or “bounce” of Jackson’s music, her use of thematic variation and impr0visation—what Amiri Baraka has classically called the changing same, Jackson’s mode of attack—accenting the first note the way a jazz trumpeter might start a solo, the physicality of her performance, akin to the frenetic energy she witnessed during second-line celebrations, and finally her trafficking in black southern church vernacular. Even less regarded by the mainstream consumers of New Orleans music is rap music, as most popularly represented by figures such as Lil’ Wayne, Juvenile, Master P, Mystical and others. Yet Woods suggest that even Hip-Hop culture in New Orleans is an articulation of the “Blues tradition of investigation” particularly in the form of the regionally specific genre of Bounce music. The New York Times recently chronicled a contemporary strain of Bounce known as Sissy Bounce, though the genre’s roots go back to the late 1980s. It was the 1990 song “Where Dey At” by MC T. Tucker that helped give the style some prominence beyond New Orleans. Woods connects Bounce to earlier forms of New Orleans musical expression, as harkening back to “critiques of the plantation bloc found in the Calinda song and dance tradition perfected on Congo Square [the “birthplace” of Jazz] during the 18th century. This was a lecture delivered by Prof Mark Anthony Neal at a symposium in honour of Mahalia Jackson’s Centennial at the 7th Annual Mary Louise White Symposium, State University of New York College at Fredonia, on November 4, 2011.